We were crowded in the elementary school gym on a 90-degree day with no A/C. We were told there would be babysitting; there wasn’t really. Our almost-kindergartners were whisked away…I was left behind to chase after my two younger boys, the sweat gathering on the nape of my neck as I cursed my black skinny jeans. There were introductions, policy overviews (dress code, lunch program, dismissal protocol…). I barely caught a word. Somewhere between doling out the fifty-billionth snack and doing laps with the umbrella stroller in which I discreetly tried to monopolize the ineffective, giant floor fan, the co-chair of the Parents Association approached. She was a woman not much older than me with a shock of black hair, tailored pants, kind, knowing eyes and a gentle smile. 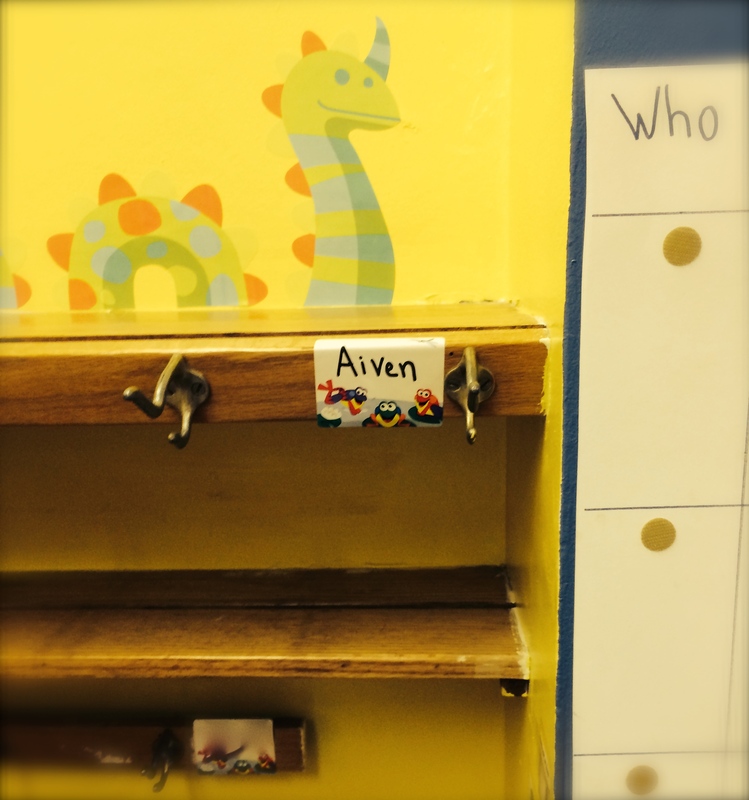 She offered to watch my younger boys so I could walk down the hallway with my newly minted Kindergartner to see his classroom – to, as she put it, “have a moment.” I felt the tears come; I choked them back. My sons were having none of it, so off we all went. But the details don’t really matter now, do they? These are insignificant, external things, after all. The real problem was with me. Something nagged at the corners of my mind and heart. What did I really need? What was I seeking? A way to neatly tie up the sum of my son’s childhood until now with a nice, pretty bow? So I could feel ready for this? So he could? 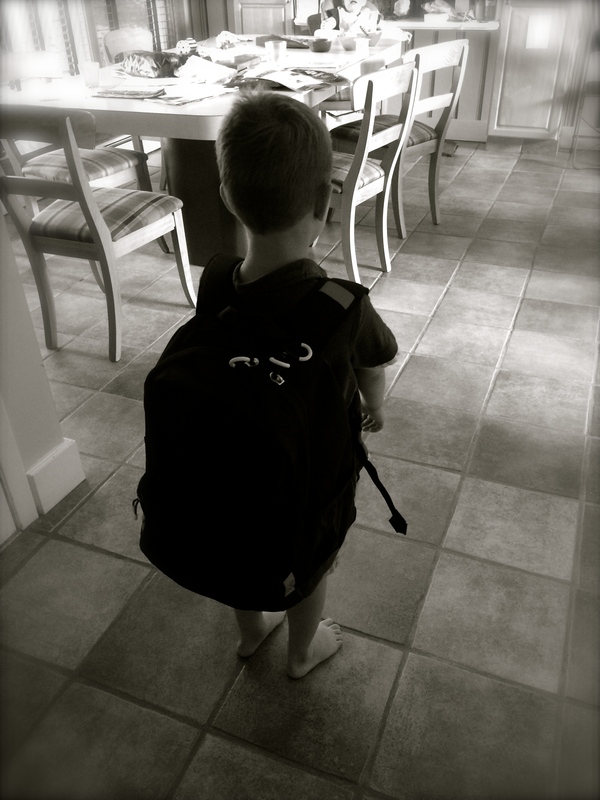 I summon the little I glimpsed of my son lined up, ready to walk off to his new classroom. He stood proud and tall. There was a little wave, wasn’t there? Maybe even a self-assured “bye mom.” And he was gone. I felt a sadness I didn’t expect. We’d said goodbye like this before—he’s a day care veteran, after all. But this was different somehow. Wasn’t this what we all hope for? That our kids become these self-sufficient beings, capable of walking off—first down the hallway, then down the street, across town, and ultimately out of our household to create another—without us? Have a moment. The words caught. That was just it, wasn’t it? My utter inability to have this moment. To hold it, savor it, squeeze the marrow from it. To stash it away in my special box of precious letters and artwork. To preserve it for all time. It was passing me by even as I was living it. Have a moment. Instead I was lost. In the sweat, the distraction, discomfort, the ceaseless chase as the younger boys wrestled free to roam the school hallways. I tried to force myself to shut it all out, to focus on what was happening. On this milestone—for me and my oldest boy. It was, of course, on the road, as we drove away with the sweet school at our backs, when the tears and clarity finally came. Have a moment. I needed that moment for me. He was fine. Ready. And it’s not about me anymore. Tomorrow, a bus comes and takes him to a classroom I will not frequent. He will live whole days I know little about. I will curtail my curiosity; I will ache for details, get few. But I carry him no more. No, I couldn’t if I tried. Now it’s nearly dawn on the day I will wake him to board the bus alone. We will have a moment. And many, many more, my sweet boy. As he becomes a little less mine, a little more his own, a little more the world’s. And I will take them with me, always. A postscript: Shortly after I published this post, he woke with a start, dressed quickly and without a fight, and was ready 45 minutes early. Hardly any appetite, yet still I felt a need to shove a waffle in his unwilling hand. I blink, and the bus is here. How many school buses had I seen in a lifetime? But this one had come to carry away my child. “Mom, when you get off the bus, wave to me, ok?” I mouth “I love you” through the window; he gives a pound in return. One last wave, a smile. I choke back tears, turn, and go on with my day…two other little boys needing me still. I was in your shoes last year—it’ll all be great. It’s such a wonderful year, I can firmly attest to with it now behind me in full, clear view. Your ability to tune in so touchingly tells me you will be present for all of it. Best wishes for a healthy, happy year! The very same moment that we have prepared them for, to walk away from us, also leaves us with the vision of only their back. We can no longer see their eyes, whether they are worried, scared, brave or fearless. Thank you for penning what I know that I feel every year when summer turns into autumn. The moments find us, don’t they, not at the times they are ‘meant’ to. This has been my biggest take away from having a large family. Oliver’s first day of school was the same day I found out my third pregnancy was twins. Those two supposedly singular, distinctly life-altering moment are now forever bound in my mind. I am sure Oliver deserved more individual attention than he got on that particular day, swimming as I was in the fact that he would now be getting two more siblings and not one, but it was a perfect encapsulation of what was to come and what you have discovered: the reality that the moments always come, just not always when we expect them. I loved sharing in your experience here. I could feel the stickiness of your skinny jeans and smell the sweet scent of sweat mixed with orange juice! Yes…love the way you articulate this takeaway–and so like you to further sharpen my clarity. For that, for reading, for sharing, and for the virtual support I felt from you these past days…thank you. Oh, Dina – so beautiful. I’m crying at work, still raw from our own “first day” last week. What powerful moments, captured so eloquently here! Immediate tears, Dina. This brought me back to when I dropped my little girl off at Kindergarten 3 years ago. For many reasons, starting formal schooling feels like releasing them into the world. They are never quite just yours again. Dina, you always take my breath away with your words. I found myself nodding and saying, “Yes, yes…” as I read. 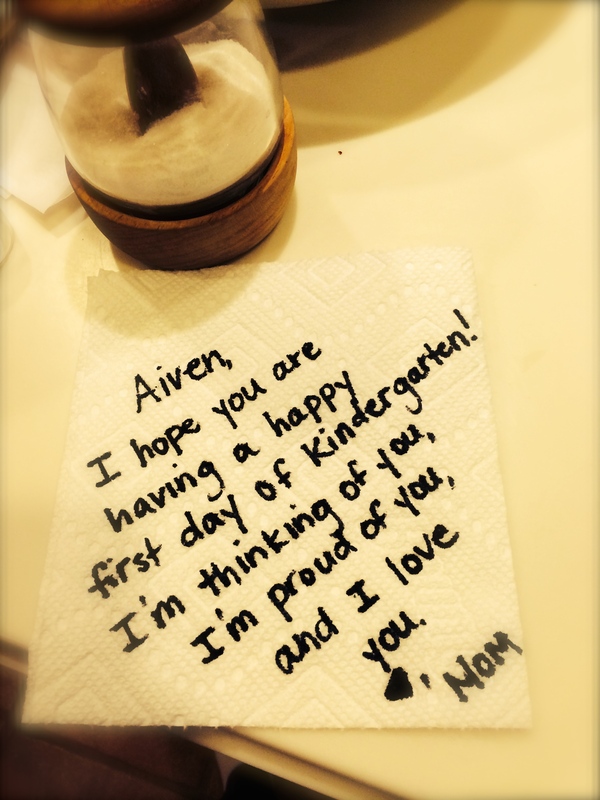 That first day of kindergarten, the first of sending them off, of trusting the world to return them to us, is so gut-wrenching that it punctures our hearts in an indelible way. Now we know what it’s like to let them go. Yes, of course we want them to go confidently into the world, but it still stings. Now, of course, I pine for those innocent Kindergarten days. Second grade is feeling just a bit too grown up for my liking. Your post prompted me to check if I wrote one when Mia started Kindergarten, but I started my blog shortly after she did. Still, you might identify with this one: http://joylovelyjoy.wordpress.com/2012/09/14/5/. Lovely, and yes. I think this is why I get so frustrated when I am trying to take pictures of my uncooperative kids- I want it to be a certain way when it is most certainly not that way. And the moments do find you- it’s just so hard sometimes to wait for them and let it all happen. We aren’t at kinder yet, but my son just turned 5 and there is something about that age for sure. Well put. I come to terms again and again with the fact that parenting–especially multiple kids–involves a substantial amount of patience mixed with letting go and allowing life to take its perfectly imperfect course. Not easy, especially for a lover of order and control like me. And yes, there is truly something about 5…happy birthday to your guy & thanks so much for reading! Oh Dina, this is so beautiful. I feel it all so deeply too. I always want that moment but now with two I rarely get them, at least now how I want them. But you made me realize here that whether the moment comes as we want it or whether we have to find time and space for it someplace else, we need to make sure it happens. Good luck to you this year, mama. You and he will rock this, I know it. i can just picture it all – it’s so tough to let them go and at the same time i feel so in awe of their bravery to do it on their own. 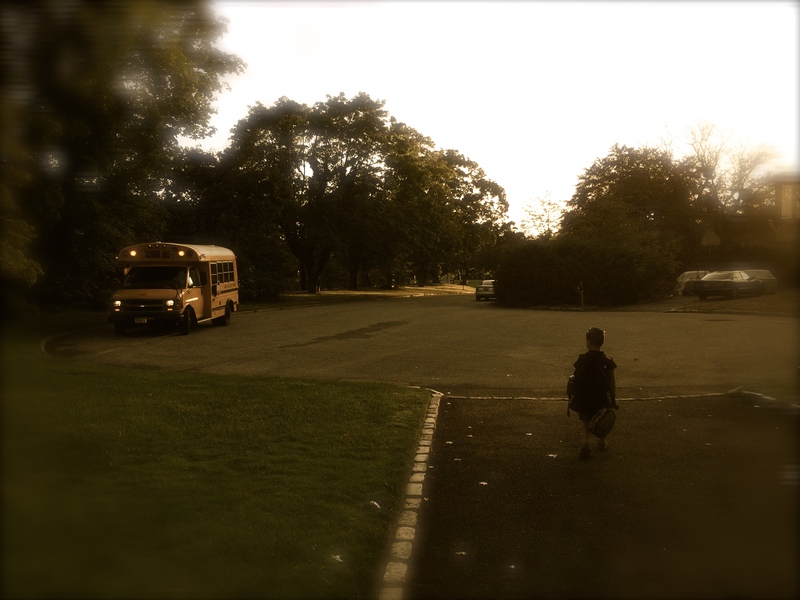 secretly, it made me a little relieved that there’s not a bus for ruth to take to school — i can hang on to that part of my day and watch her depart for few more years. i dropped ruth at her first day of 1st grade today and we were all a little weepy about that too. miss you guys. You have me crying here. I love this post. The postscript, though, really got me. How many buses do we see? We don’t give them a thought (unless we’re running late and they’re stopping at every other driveway). But this one was here to carry your son away. This. “As he becomes a little less mine, a little more his own…” It is painful and beautiful. Love it. Oh, this one made me cry. I remember when my youngest started kindergarten last year, I was a mess. I walked him to his class – and as I left – I fell apart. I love when the kids get so excited for school, that they get up early. On my daughter’s first day of first grade, I found her sitting on the couch, dressed and ready to go – at 4A.M. !